Check out latest Allworx press releases and media coverage. 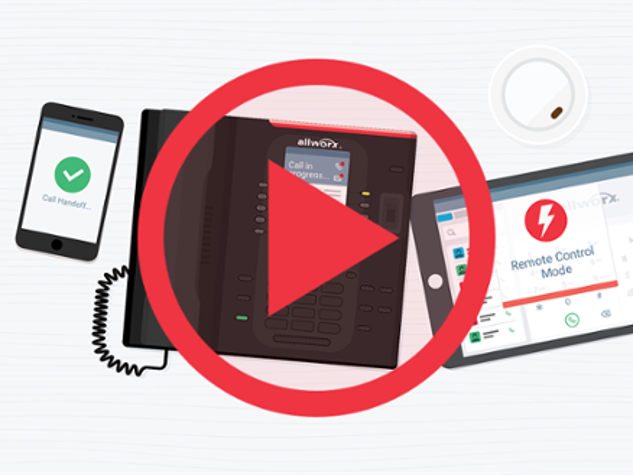 March 21, 2019 — Allworx Corp., a Windstream company, today introduced the latest generation of software supporting the award-winning family of Allworx VoIP communication systems designed for Small- and Medium-sized Businesses (SMBs). Supporting Allworx Connect™ servers, Allworx Verge™ VoIP telephones, linked mobile devices and other equipment, these software upgrades provide valuable enhancements and features for their expanding base of customers. UPCOMING — April 9–12 — Allworx will be at Channel Partners this year in booth 1871 with our latest product enhancements and marketing programs One of the highlights will be our ABC program that creates a recurring revenue business for our partners. Byline Finance — our partner in the ABC program — will be sharing the booth with us. Representatives will be on hand to answer your questions and show you how the ABC program drives more business and adds enterprise value to your company. October 2018 — At the Allworx Western Summit in Las Vegas last month, Allworx hosted over 35 of our Allworx Authorized Partners for two days of sharing information on the Allworx Road Map and on new marketing programs available from Allworx. The Allworx A B C program which works in conjunction with our financial partner Byline, was rolled out to the audience. The program allows Resellers to sign up customers for long term contracts to rent equipment and services and get paid up front. A great way to build the business. Allworx also had several third party providers of equipment in attendance to show how easy it is to construct a total site solution for an end user’s communications needs using their offerings in conjunction with Allworx systems. October 26, 2018 — Allworx attended the ScanSource One Comm Conference in October at Hilton Head, SC. We were able to meet with lots of ScanSource management and sales staff and bring them up to date on the latest features and capabilities of the Allworx product line. Also in attendance were many of ScanSource’s largest customers, several of who are Allworx Authorized Resellers. They were excited about upcoming features on the Allworx platform and also the enhancements being made to the Mobility feature set. July 27, 2018 - Upgrade to the latest technology AND save money ... with NO capital expense! This was the message at the ASCII show in Charlotte last week, where Allworx presented to over 100 Managed Service Providers. The topic was the need and the benefits of taking over the entire end-user customer site for both voice and data services. Monthly recurring revenue growth has been a theme for all the ASCII shows and ASCII members are keenly interested in how to grow that stack of revenue. Allworx emphasized the new ABC rental program and how with this program Reseller can get lots of MRR and still own the customer. In other agent scenarios, commission revenue may be there but the customer belongs to the carrier. May 19, 2018 - Allworx participated in the ASCII Trade Show in Chicago, IL this past week at the Hilton O’Hare. A large group of Managed Services Providers attended the Allworx presentation and heard about the new Allworx ABC Rental program designed to add Monthly Recurring Revenue to their business plan. Owning the site for both voice and data and doing it on an MRR platform was a popular strategy formula presented by Allworx. Also, lots of interest in learning about Allworx’s success in such vertical markets as Education, Auto Dealerships, Municipalities, Professional Services. March 23, 2018 - Allworx was at the ASCII Trade Show in Fort Lauderdale, Florida this past week meeting with groups of Managed Service Providers. At the presentation of the Allworx products the ease with which an MSP could get into the entire Voice side of the marketplace was emphasized. Many of the companies in attendance are looking to ‘stack revenue’ from their customer base and take control of the entire customer site for voice and data. The Allworx solution, with low market entry costs and simple installation, fits the needs of many of these growing companies. Adding voice not only adds revenue; it adds business value to companies signing up as Allworx Authorized Partners. Jan 18, 2017 - Allworx introduced Allworx Verge™, a new class of mobile-first IP phones for businesses. Allworx also introduced System Software 8.2, Reach™ 3.0 and Interact™ Professional 3.0. Feb 19, 2016 - Allworx is named 2016 Best Channel Vendor by Business Solutions Magazine in the VoIP category. Sept 18, 2015 - Allworx and IP Simple helps easily divert incoming calls when Arch Auto Parts’ Atlantic Avenue location in Brooklyn, NY was shut down due to a fire. June 30, 2015 - Sandra Gustavsen, analyst with Business VoIP, provides an overview of the new Allworx Connect servers and what makes them unique. Mar 30, 2015 - Allworx is named 2015 Best Channel Vendor by Business Solutions Magazine in the VoIP category. Mar 23, 2015 - Associate Editor Sean Buckley discusses the results from Allworx's SMB survey about their attitude and usage of business phone systems. Mar 20, 2015 - Peter Bernstein, senior editor at TMC, discusses why these survey results should be a wake-up call for the telecom industry. Mar 17, 2015 - Contributing Editor Pedro Hernandez discusses why the Allworx Connect platform is still relevant and important in today’s mobile age. Mar 17, 2015 - New survey reveals perception and usage trends of business phone systems among small and medium- sized businesses. Mar 16, 2015 – Carol Wilson, editor-at-large, explains how Allworx Connect simplifies VoIP/Unified Communications for SMBs. Mar 16, 2015 - Allworx's Chris Hasenauer discusses the new Allworx® Connect™ platform with CRN. Mar 16, 2015 - Allworx unveils Connect, the next-generation VoIP communication systems, and System Software 8.0. Mar 10, 2015 - Allworx Interact™ Professional and Allworx View™ receive 2015 INTERNET TELEPHONY Product of the Year Awards. Nov 7, 2014 - Allworx has announced that Annie Ahari has joined Allworx in a newly created Director of Marketing position. Oct 7, 2014 - Allworx has introduced Allworx View™ and Allworx View ACD to provide call activity data analytics. Aug 14, 2014 - TMC has awarded Allworx Reach a 2014 Communications Solutions Product of the Year Award. July 28, 2014 - Target Distributing of Germantown, Md. has been appointed as the latest Authorized Distributor. July 24, 2014 - Allworx has promoted Thomas Elliott to Director of Sales and Business Development. June 23, 2014 - System Software 7.7 offers Virtual Network Interfaces for separating voice and data via virtual interfaces. June 23, 2014 - Interact Professional 1.1 provides intuitive control over an Allworx phone through a customer’s computer. Feb 21, 2014 - Allworx Interact™ Professional won the Best of Show Award, Best SMB Solution, at TMC’s ITEXPO. Jan 22, 2014 - Allworx has been recognized as one of the 2013 Best Channel Vendors in the VoIP category by Business Solutions magazine. Dec 13, 2013 - Allworx System Software 7.6 enhances dial plan and streamlines administration. Dec 6, 2013 - Allworx announced that support for its popular Allworx Reach™ application has been extended to include Android devices. Nov 18, 2013 - Allworx introduces Interact™ apps that leverage the desktop to manage phone calls and increase productivity. Oct 2, 2013 - Allworx introduces PowerFlex™, extending its product portfolio and simplifying installations. Mar 1, 2013 - Allworx today announced its participation in Alaska’s world-famous Iditarod as a Team Dog sponsor and provider of the race’s phone system. Feb 12, 2013 - Allworx has announced that its new mobile phone client, Allworx Reach, was awarded Best of Show for SMB Solutions during ITEXPO Est 2013. Jan 31, 2013 - Allworx today introduced Reach and System Software 7.5. Allworx Reach is a virtualized Allworx handset that is designed to run on mobile devices. Sept 25, 2012 - Allworx announced today that its product line has achieved a compliance certification by the Avaya. Mar 27, 2012 - Allworx introduces new 9202E IP phone and system software 7.4 at Enterprise Connect 2012. Feb 3, 2012 - Allworx 48x IP phone system receives 2011 INTERNET TELEPHONY Product of the Year Award. Feb 1, 2012 - The Allworx 6x12 Phone System now allows small offices, with up to 12 employees, to utilize the cutting-edge VoIP features. Jan 24, 2012 - Allworx today that it has been recognized as a “Best 2012 Channel Vendor” in the VoIP category by Business Solutions magazine for the third time. Dec 20, 2011 - Allworx announced that TMC has named the company as a recipient of its 2011 Unified Communications Excellence Award. Aug 8, 2011 - Allworx announced that Allworx 48x has received the “Best Channel Product of 2011” awards in the IP PBX and IP Phone categories. June 29, 2011 - Allworx announced that it has released its System Software 7.3, which integrates the most requested features into a simple to use interface. June 22, 2011 - Allworx and ScanSource have signed an agreement to expand their partnership to distribute Allworx product line in Latin America and the Caribbean. Feb 2, 2011 - Allworx today unveiled the Allworx 9204G, the newest addition to the Allworx series of IP phones. Oct 20, 2010 - Allworx announced the addition of 48x phone system and System Software 7.2. 48x supports up to 250 employees per site. Sept 22, 2010 - Allworx and SIP Print announced that Allworx has completed testing and confirmed interoperability with SIP Print’s Call Recording. Aug 31, 2010 - Allworx announced that Allworx 6x phone system and 9204 IP phone have received the Best Channel Product of 2011 Awards. July 12, 2010 - Allworx announced that David Plakosh has been named its Vice President and Chief Technology Officer. July 6, 2010 - PAETEC announced that IP Simple received TMC's 2009 Communications Solutions Product of the Year Award. Feb 1, 2010 - Allworx appoints Chris Hasenauer as Vice President and General Manager. Jan 27, 2010 - Allworx announced that it received the ‘Best of Show’ award at ITEXPO East 2010 for the Best Onsite Product Launch. Jan 20, 2010 - Allworx today at ITEXPO East 2010 unveiled the Allworx 9204. Allworx® Named "2010 Best Channel Vendor"
Jan 14, 2010 - Allworx today announced it has been recognized as a “Best Channel Vendor” by Business Solutions magazine for a second consecutive year.